We are all familiar with how to make gingerbread cookie recipes; those cute little boys and girls dressed up for the holidays. Colorful frosting is used to dress them in bright colored clothing to enhance the holiday spirit. Often little holes are made in the tops so ribbon can be threaded through it to make a loop for hanging on the Christmas tree. People were learning how to make the gingerbread cookie recipe all the way back to probably the fifteenth century. This is the primary recipe of Christmas cookie recipes in many households, especially in Europe. England and many European countries are famous for cutting their traditional ginger cookie recipe in the shape of small men figures, therefore calling it their “gingerbread men recipe”. I could not wait to learn how to make a gingerbread cookie recipe because I love the flavor of ginger and molasses. Most often I cut them in regular Christmas cookie cutter shapes such as balls, bells and trees. I have found that many of the gingerbread men cookie cutters do not do a very good job of cutting the shapes and are too time consuming for me. (I don’t have the patience) You really need a gingerbread man cookie cutter with simple rounded lines; not many indentations or sharp cuts. When my children were little, this was a great project for them. They could sit for hours and decorate the little people. They also enjoyed sampling “broken ones”; who knows if it was broken by accident or on purpose? They really amazed me at the good job they did. These are memories I will never forget. In a large bowl cream together the butter, sugar and molasses. Blend in the water. Combine the flour with the soda, salt, cinnamon, cloves, allspice and ginger and sift. Blend all the dry ingredients in with the butter and sugar mixture. Refrigerate dough until firm to roll. Roll dough out on a floured surface until about ¼ inch thick. Cut out with your gingerbread man cookie cutter or with your favorite cookie cutters. Place far apart on a lightly greased cookie sheet. (These puff up and spread out). Bake 10 to 12 minutes or until cookies are set and firm. Cool slightly before removing from the pan. When cookies are cold, ice and decorate with a powdered sugar icing. The following recipe for gingerbread cut out cookies is a little different than the first one and equally delicious. These are made with a combination of all purpose flour and whole wheat flour. Beat sugar and butter until light and fluffy; add molasses and egg and blend well. Measure all purpose and whole wheat flour in another bowl; add and blend in ginger, cinnamon, salt and baking soda. Mix well, cover and refrigerate for 1 hour. Roll dough out on floured surface to ¼ inch thick; cut into desired shapes. Place 1 inch apart on ungreased cookie sheets and bake about 6 to 8 minutes or until set. Cool 1 minute and carefully remove from cookie sheet; cool completely before frosting and decorating. 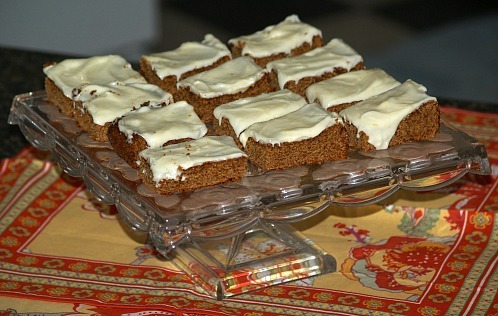 This gingerbread cookie recipe is in form of ginger bars and is very delicious; especially with the lemon frosting. Beat butter and sugar together until fluffy; add egg and molasses and blend well. Sift flour, baking powder, baking soda, salt, ginger and cinnamon together. Combine dry ingredients with creamed mixture and blend well. 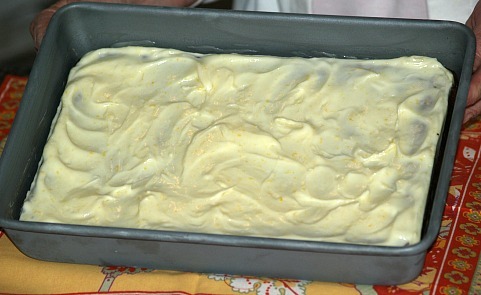 Spread batter evenly in prepared baking pan; bake about 20 minutes or until pick comes out clean. Cool in pan until cold; then frost. 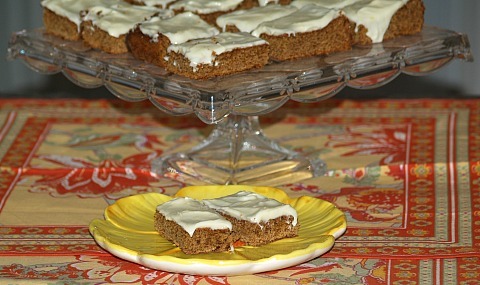 This recipe is good on any gingerbread cookie recipe or ginger bars. Beat cream cheese until smooth; add sugar gradually while beating. Beat in lemon juice and spread over the bars; sprinkle top with grated lemon peel. Chill until frosting sets; cut into bars. This gingerbread cookie recipe is one of the best cookie ideas for Christmas, especially if you have children in your home. They will love this! Directions for how to make gingerbread house is made from a recipe for gingerbread cut out cookies. Unlike some recipes, it is firmer and will hold together when building the house and decorating. Combine and blend flour, ginger, baking soda, allspice and slat. Beat brown sugar and 1 cup butter in a large mixing bowl; beat in corn syrup and eggs. Gradually add flour mixture and beat on low until well blended. Roll ¼ of dough directly onto large greased cookie sheet about ¼ inch thick. Place pattern for roof on one end of dough and cut around with knife; repeat at other end of dough for second roof part. Remove dough scrapes, reroll and save; leave house parts on tray to bake. Bake 15 minutes or until no indentation remains when touched. While cookie is still hot lay pattern back on cookie and trim with a sharp knife. Let cool on tray 5 minutes, and then remove with spatula to cool completely. Repeat this process for 2 house ends and 2 house sides; bake all pieces and let set until cold. Pipe royal icing (glue) on edges or seams of all pieces, even on bottom to seal house on base. Glue shutters on house, shingles on roof and all decorations with icing. Beat egg white in bowl with mixer; gradually add 2 cups to 2 ½ cups powdered sugar and almond extract. Beat on low until all is moistened; increase speed and beat on high until icing is stiff. NOTE: You can divide icing and color in different colors to decorate. Sift flour, spices and salt. Heat butter and molasses (do not boil) and remove from heat; beat in soda. Add milk and beaten egg; stir in dry ingredients. Bake on greased waffle iron or griddle. Serve hot with whipped cream, sweetened and flavored.